Suits, Taskmaster and Storage Hunters UK are among the shows now available on Amazon Fire TV and the Fire TV Stick via the new UKTV Play App. 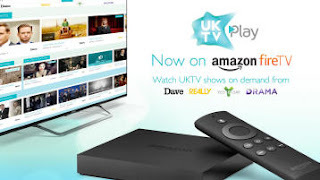 UKTV, which operates Freeview channels including Dave and Really, launched its on-demand service on Amazon's TV platform today. The UKTV Play app on Amazon Fire TV devices includes a new feature which enables users to create their own bespoke collections via 'My List'. This new function will be rolled out onto other UKTV Play devices in the coming months. The latest addition to Amazon Fire is part of a rapid roll-out of UKTV Play across multiple platforms since its launch last year. Amazon Fire TV and Fire TV Stick join YouView and Virgin TV in offering the on demand service, which is also available on iOS, Android and PC. UKTV Play provides catch up and on-demand access to programmes from UKTV's four Freeview channels Dave, Yesterday, Really and Drama.